n00b squad - "Wiimergance Day"
Fields, horses, there’s Link in it…oh and it’s awesome. 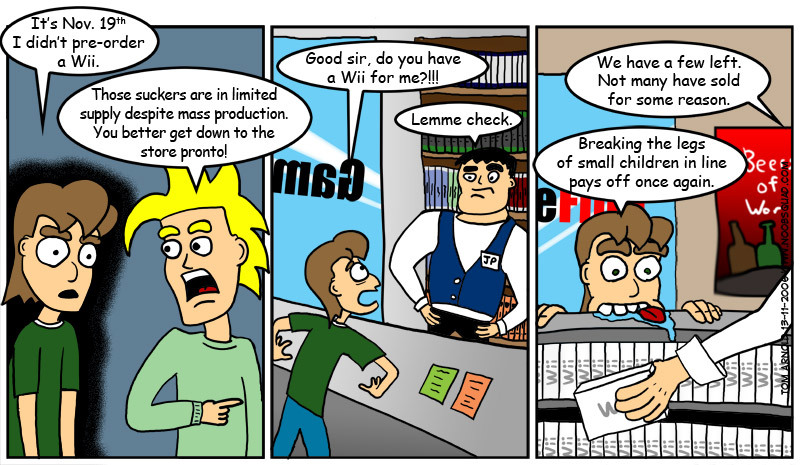 Sadly, neither I nor any of my friends managed to pre-order a Wii. Pre-ordering was just too damn easy last generation for the ‘cube so I took it for granted. Fortunately, Nintendo will be releasing four million Wiis by the end of the year so obtaining the device should be possible, unlike the other other console that comes out two days beforehand. I can safely say that Gears of War is the killer app for the 360 that puts almost all the other 360 games to shame. After playing Gears, Project Gotham Racing 3 is a barren plain with hardly any detail in site. Of course, no game is complete without solid gameplay. One of the most rewarding aspects is how many bullets each enemy takes before finally keeling over in a bloody visceral fashion. Then thanks to well placed checkpoints, it’s easy for me to pick up and play for a short while yet realize afterwards I’ve been playing for hours while plowing through chapters a la Resident Evil 4. Some people might not like Gears of War, such as Andre, but then again, some people eat other people.